A failed attempt the last time around had me on High Alert. I was at Landmark by 6 pm for an event scheduled for 7 pm. Yes Yes I know I was early, but heck, the event was in a book store. So, what is the harm in being there early? Yes, of course I read. Why was I in Landmark in the 1st place? To meet the Lord ofcourse. Who Lord? 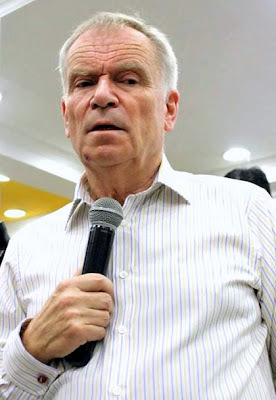 Lord Jeffrey Archer... D'oh!! <silence> Yes, that was it. The third book in the "The Clifton Chronicles" was to be launched that evening by the author himself. "Best Kept Secret" is the highly anticipated third installment of "The Clifton Chronicles" and takes the reader on a breakneck journey from Bristol to the US and on to Buenos Aires in the mid-1950s. He spoke about how in Bangalore, a 12yr old girl had stumped him. She had a book published already. He mentioned how at the age of 34 was when his 1st book got published. In Chennai, a girl who asked him a question shared that she had recently published a book, and she was all of 22 yrs of age. He shared with us how tough it is to get published, how to sustain and how to write so as to keep the audience engaged. During the Q&A session, there were so many of us with our hands raised, alas only a few got the chance to ask their questions. One of the questions put forth was - Will you ever write a book on India? For which he promptly replied "oh no, I am very scared, India overwhelms me"
Before closing the session, when asked about his personal favorite and most popular of his books, he shared that Kane & Abel was in its 94th print. Yes, I did get a copy, actually 2 copies autographed by the Lord. One for me and other for a friend, dint mind that I had to stand in line for nearly 45mins.. ~! !